Spring is a good time for Bird photography in the Black River area with focus on leking Grouse from hides, Owls on ringing sessions & in natural habitats. Divers and Slavonian Grebes in summer plumage, the latter at very close range. Add to that a boat safari to photograph Osprey catching fish at close range. Garden feeding stations with Hawfinch, Bullfinch and Bramblings, Siskin, Yellowhammers and other passerines is an added value. 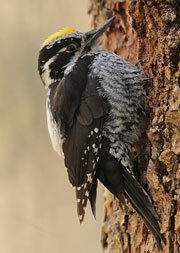 Three-toed Woodpeckers if we have located any nesting sites. For Black Grouse we have a comfortable hide with proper beds, heater and toilet that allow you to wait patiently for the birds without any lack of comfort. We provide you warm & cold drinks and snacks so you won't lack energy. The Capercaillie session requires spending the night in a tent hide. During the week you will of course also have proper lodging in a hotel or B&B. where we photograph the birds from very short distance. Check in at B&B. Dinner and transfer to Capercaillie hides. Morning session Capercaillie. Pick up 9.30. Breakfast and light session for Black-throated Divers in forest lake. Midday rest. Evening excursion for Great Grey Owl. Night in B&B. Boat safari on Lake Mälaren to photograph Osprey catching fish at close range. Very good chances on great action shots. Mid day rest. Afternoon session ringing Ural Owls. Transfer to Black Grouse hides. Night in Black Grouse hide. Morning session Black Grouse. Pick-up 9.30. Brunch. Optional session at feeding station for passerines, chance for Bullfinch, Brambling, Hawfinch, etc. 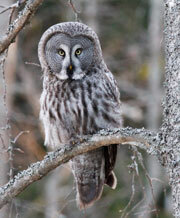 Evening excursion for Pygmy Owl and again if requested Great Grey Owl. Night in B&B. Very early morning excursion (2 hours drive) for Red-throated Divers and Goldeneye on breeding ground surrounded by board walks. Very accessible. Black-throated Divers on the way back. Mid day session ringing Tengmalm´s Owls (if they breed) only some years. last evening with Great Grey Owl or Moose safari. Night in B&B. (Optional) Extra morning session Capercaillie/ Black Grouse (if requested). Afternoon departure and transfer to airport. + 2.000 SEK single room supplement. 2.500 SEK /person for extra day.